Set between the valleys of Oschiri, it is located on Monteacuto, at the entrance to the Gallura area, but within the province of Sassari. The lake of Coghinas collects the waters coming from the Rio Mannu rivulet and from the river of the same name. Its origin dates back to 1927 when, in the wild setting of the slopes of Monte Limbara, the barrage and the hydroelectricity power station were implemented on one of the greatest bodies of water of the Island, the Coghinas. The dam, which is 185 meters long and 58 metres high, dominates the end part of the basin, which has a capacity for 254 million cubic metres of water. On the eastern bank of the gorge, you will notice an Art Nouveau style villa: it was the home of the director of the plant, which was later abandoned. From here, the lake opens up, following the route dictated by the mountains, bathing 18 square kilometres of territory. 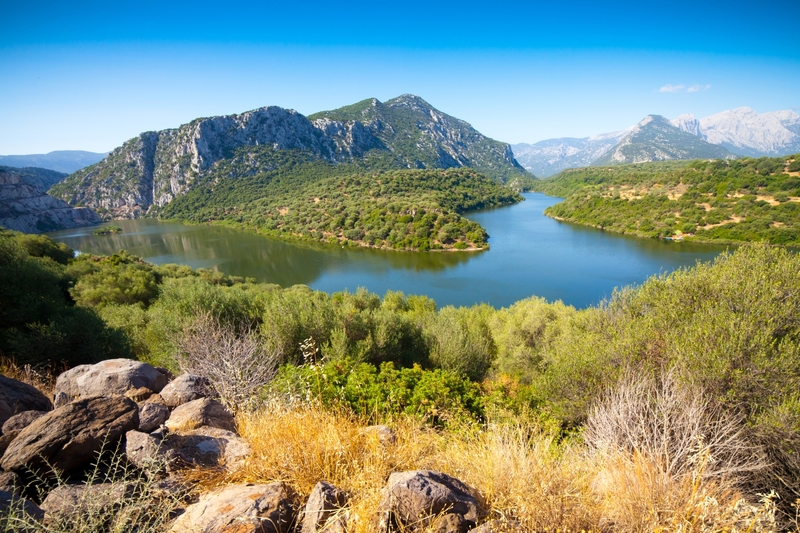 All around, valleys are dotted with Mediterranean scrub, holm oak forests and cork oak woods as far as the eye can see. The winds are channelled through the mountain inlets creating a climate that suits the life of many plant and animal species: Largemouth bass, European perch, catfish, carp and Louisiana crayfish are the prey of those practicing recreational fishing. For bird-watching enthusiasts, various bird species offer exciting viewings. 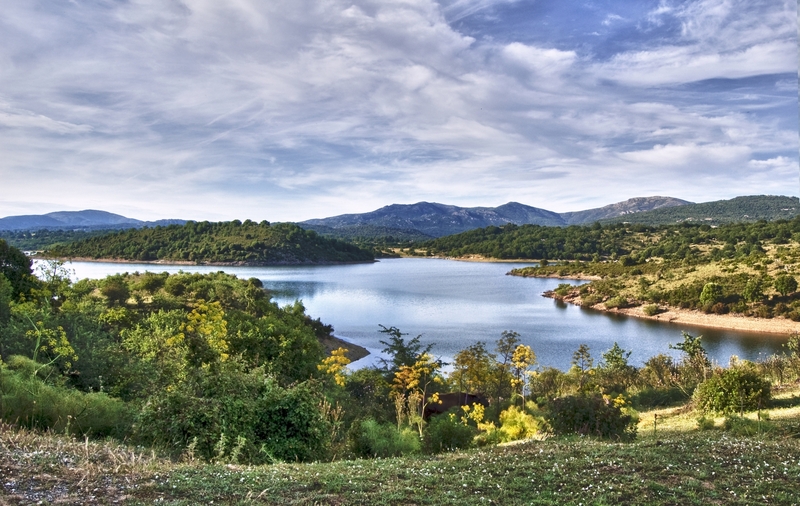 In the lake, nothing seems left to chance: you can do some trekking or mountain bike riding on trails along the river banks or, if you are seeking moments of serenity, you can enjoy the shade of holm oaks and cork oak woods either on foot or on horseback, following the paths by taking guided tours. On the subject of nature itineraries, near the lake, a trip to Su Filigosu is a must. This is a reforested area on the slopes of Mount Limbara, populated by deer, fallow deer and mouflons. To admire the environment of the lake 'from the inside', you can hire canoes or kayaks and reach vast inlets with smooth rocks. If, however, you want stronger emotions, you can spend your time doing some water skiing during trips to the lake. Every year, enthusiasts and curious visitors come to Coghinas to watch the high-speed jet skiing during the speciality Italian championships. However, sport and nature are not the only things: for relaxing, there are the thermal and accommodation facilities a short walk from the lake, as well as restaurants and agritourism facilities where you can taste the delicacies of the Gallura area. To complete the tour, visit the old town centre of Oschiri, a splendid example of rural architecture, with narrow roads, paved in stone. Five kilometres from the village, in a territory dotted with Domus de Janas, tombs of Giants and nuraghi (can be visited), the church of Nostra Signora di Castro stands out: it was built at the end of the 12th century in Romanesque-Lombard style, and is striking testimony of Sardinia in the Middle Ages. From SS 131 take the turnoff to Mores and continue towards Ozieri - Chilivani. From Chilivani take SS 597 towards Oschiri - Tempio. The lake is visible from the road and can be reached by driving over a bridge. Do you like this place? Olbia and San Teodoro could be your ideal destinations.